I am overdue for another post on teaching with technology. 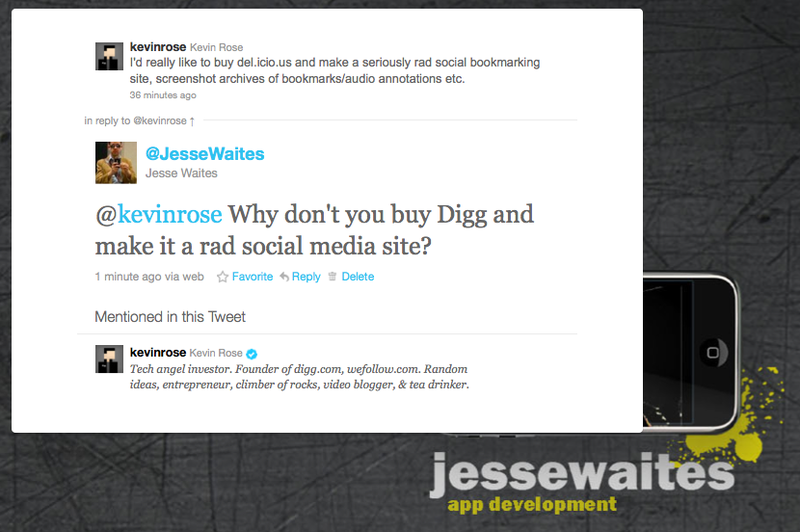 This post is about the social bookmarking tool delicious (or Del.icio.us as you may know it). Yahoo! announced that they are shutting down delicious. I decided to write my review anyway, since this review is mainly about social bookmarking tools, which can certainly exist whether or not delicious does. Bookmarks are available online and are always available. Bookmarks can be shared with others (and are shared with others whether you like it or not). Bookmarks are tagged instead of put in folders, which improves accessibility. The only problem with delicious is that #1 and #2 are at odds with one another. The tags and bookmarks on delicious are public, which means that everyone can see who else tagged the same bookmarks within delicious, and outsiders can view the list of bookmarks that I’ve tagged. I’ll admit, that part of the social networking aspect is a bit creepy. However, it was easy enough to make bookmarks private, which essentially solves that problem. However, the tags for the bookmarks are still public (the solution here is to use inconspicuous tag names). I was annoyed that Yahoo! announces my bookmarks to everyone and their mother on Yahoo! sites. This meant that my relatives occasionally are perplexed by my choice of tags. I never figured out how to manage the privacy settings on delicious, and this comes from someone who was able to master Facebook’s complicated and ever-changing privacy settings. Delicious just didn’t have an easy and transparent way to manage privacy settings. I can’t see too many uses for delicious in the classroom, unless I was teaching a course in which we needed to find many links to content specific material. If I were doing so, Delicious makes it easy to add others to my network (but in reality, I’ve added two people). We can create a common tag like the rubric for the course in order to find one other’s bookmarks. I had been hoping to use Delicious in a course I developed on algorithm analysis, but alas, the class was canceled and I wasn’t able to try this. In retrospect, I found that benefits #1 and #3 are a big deal to me. I am surprised by that. But then again, browser bookmarks haven’t really changed since I started using browsers. They could really use some revamping to be useful, and a tool that offers serious benefits in that department could make a really big splash. Despite the demise of delicious, I am hopeful that there will be better bookmarking options in the future. In the end, I am not surprised that Delicious is being shut down. It’s a handy little tool that I will miss, but it doesn’t offer enough to revolutionize how I do things online, and it’s certainly not a game changer with respect to social networking. The conflict between accessibility and privacy was always a concern for me, and maybe that was an issue for others. But I do hope that a new tool with better features replaces it. Do you use delicious? How do you save and organize your bookmarks? Should Kindles be used in higher education? This entry was posted on Friday, December 17th, 2010 at 11:13 am	and tagged with social networking, teaching with technology and posted in Uncategorized. You can follow any responses to this entry through the RSS 2.0 feed. « operations research for six year olds? A recent article in Newsweek asserted that the founders of Digg had missed an optimal opportunity to cash out, thinking the site would grow in valuation when in fact the valuation has started to decline. The author said that Twitter is the unexpected culprit: people now share links by tweeting rather than by posting to Digg. Tweeting lacks a ranking system (as far as I know, but I’m not a Twitterer), but it’s a quicker way to let people know about something you’ve found. I don’t see it competing as an online bookmark archive, but it may be causing a loss of interest in Delicious as a bookmark sharing service. I’m a Firefox user, and the Firefox Sync add-on lets me keep bookmarks (and toolbar settings) in the cloud, so at least on machines I own/control, I’ve got bookmarks synced. One can also store bookmark files on cloud services such as Dropbox. I think what we could really use in OR is an OR-themed bookmark tagging service. I’m not particularly interested in sharing all my bookmarks with the rest of the world, but the bookmark equivalent of an “annotated bibliography” for technical sites (blogs, forums, data/software/courseware repositories, etc.) would be pretty handy … if people would spend time tagging bookmarks, and not just be consumers. 2. Post bookmarks to that class or subject that has relevance, online references, texts, books, etc. I love delicious because it keeps all of my online “tools” in one place. Hate the thought of it dying. Thank you for the suggestions, Larry. I agree–delicious could be useful for a class. It doesn’t require software to be installed. It doesn’t even require students to create a new account as long as they use a Yahoo! account, so it’s easy to get started with it. I’ll have to explore a new way to try your suggestions. 1. I will have to check out the Firefox features. I am also a Firefox but didn’t know such options existed. 2. Yes, I find that twitter is a great place to instantly share and even store links. Most of the articles I read online are suggested by twitter users. I also have tweeted links when telling myself that I will be able to find the link again by checking my twitter feed. 3. I would love an OR-themed bookmark tagging service. Mike Trick had a OR directory back when the Internet was relatively small. INFORMS has a page of resources now. But tags would help the organization as the number of OR sites continues to grow. I wouldn’t want to be in charge of maintaining such a tagging service, but I hope someone else is inspired. Per Pauls remarks, I was hoping the IEOR Tools would be a place for an annotated reference albeit I know I favor Open Source. Sorry about tooting my own horn on your blog Laura.